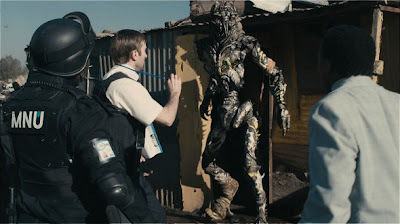 District 9, Neill Blomkamp's 'sleeper' science fiction film produced by Peter Jackson's Wingnut production comapny, is very much about 'the Others' as signified by the immigrant aliens at the centre of the story, in a film made in South Africa. Audiences have been exposed, through decades of science fiction cinema, to various responses to imagined invasions and the dominant trope remains that the correct form of response is to immediately kill, attack or go to war with these invading Others. Here, the Others take on other dimensions and the film allegorically responds to how a white society treated the indigenous black population in the South African apartheid as well offering a contemporary view of 9/11 and the war of terror against the Other, the ghettos forming some kind of visual representation of Guantanamo Bay. Director Blomkamp's film is also quite unapologetically about the enforced removal of 60,000 mainly black inhabitants from an area of Cape Town, called District Six, during the 1970s. The history of District Six points to an apartheid government that basically smeared the cosmopolitan inhabitants of the area with stories of vice dens, prostitution, gambling in order to declare the area a slum, clear it and grab the land and declare it for whites only. 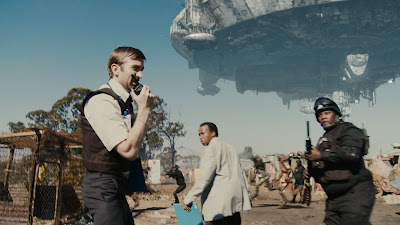 Blomkamp's film takes this unfortunate chapter in South Africa's apartheid history and layers it into a story about 1.8 million displaced aliens, stranded on Earth for 20 years on the outskirts of Johannesburg, forced out of their own makeshift township by a government dominated by a private military contractor MNU. The story not only refers to the District Six events but it also reflects similar events in new surburban ghettos in post-apartheid South Africa. Where the film was shot, Chiawelo in Soweto, was, with little irony I presume, also the site of similar attempted evictions. Blomkamp focuses on a number of issues on the back of this, everything from extreme xenophobia, racism, arms trading, genetic experimentation, government cover-ups, and the risk is that the film may have become a dry, left wing polemic. The film is already accused of being a retroactive, out of date civil rights story. However, it's really not quite all or any of these and the moral messages are wrapped up in a bundle of hyper violence, body horror, big spaceships and CGI creatures. It's a good tale, well told and it gets you thinking. And that counts in a summer full of dull, anodyne blockbusters that would even struggle to articulate a view on the price of carrots. It's complex and contradictory. The population that had settled in District Six weren't aliens. They were the indigenous inhabitants of a cosmopolitan area of Cape Town and the land was theirs and it was forcibly taken away from them. The aliens in District 9 simply turn up and become rather heavy handed, cat food munching metaphors. 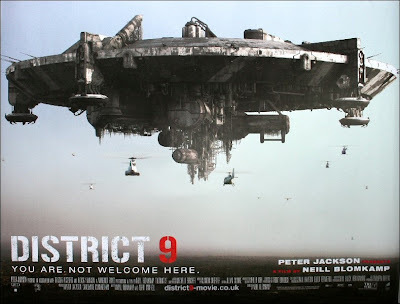 They just want to go home because they don't belong on the planet and they have no claims to lands because the government put them in District 9 in the first place and now wants them to be evicted to District 10. It doesn't use its racism metaphor card in a particularly articulate way and the story is far more effective if it's seen as a treatise on xenophobia and the complex notions of 'the other'. 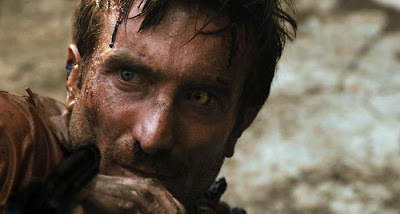 The central, everyman character Wikus van de Merwe, at the heart of the Blomkamp film, is especially well played by Sharlto Copley. Wikus goes on a journey where he eventually becomes the very thing he dislikes, the alien that the authorities seek to marginalise and deny any rights to whatsoever. A misguided man, rather than a thoroughly evil one, he's a bureaucrat charged with evicting the aliens and actually delights in their misery. A particularly disturbing scene is where he finds great amusement in the sound of exploding alien eggs as they burn in a building torched by the private security company. He doesn't initially endear himself to the audience and the trick here is that he is also signified as the film's hero. The audience is therefore asked to invest a lot of faith in the character but the character switches his morals as rapidly as he'd probably change his underwear so it is hard to get some sympathetic bearing on him. The man undergoes a hideous transformation, akin to something from The Fly in terms of the gross out quality but also very much working at the metaphorical level of the man/insect duality of Kafka's Metamorphosis and whilst you feel sorry for him you can't help feeling he somehow deserved his fate. His status comes across as a not so subtle Christ metaphor. All that self sacrifice to get a cross shaped space ship to fly and free the aliens? There are moments in the film where he's shrouded in a grey blanket that are just too coincidental to shrug off the feeling that Blomkamp is chucking in some sort of religious parable too. As the government strips away his rights as a human and in fact hunts for him as a useful alien/human genetic hybrid, he falls in with the alien Christopher Johnson (very much like the human names attributed to aliens in the movie and series Alien Nation) and his son. 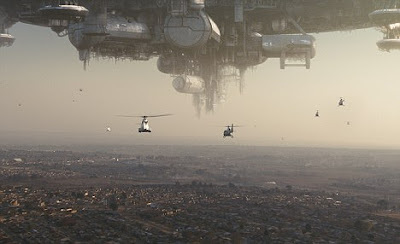 They demonstrate that the aliens aren't all worker bees and are in fact intelligent creatures capable of spending 20 years preparing a shuttle to return to the mothership hovering above Johannesburg. The film flip-flops between human-alien buddy bonding, the relentless hunt by the 'white men' of the government and the black mercenaries who all want a piece of Wikus to get control of the alien arms trade. 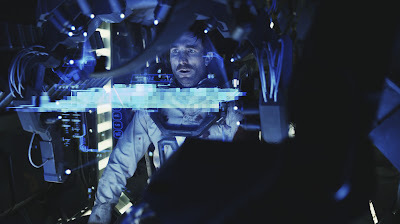 Wikus trades passage on the shuttle for a medical procedure that will return him to human status but then snatches the ship from Christopher, abandoning him, attempts to fly the vehicle and ends up crashing it. It's at this point that the plot does resort to cliche when suddenly the alien son saves the day by miraculously getting the mothership to tractor beam the shuttle from the surface. Very convenient. All this is told through the prism of the media so it's as much a critique of media saturation and manipulation as it is an allegory about apartheid (there is an ironic smear campaign suggesting Wikus has been caught shagging aliens) and the film is bolted together through faux news footage, to camera interviews and security camera coverage. Taking a leaf from Cloverfield's book, this approach works well, adding a verisimilitude to the events evolving on screen but Blomkamp struggles to maintain this and by the final half there is less and less of this approach and more of a standard action film construction. The finale belts along at a fair pace, is full of action and gore and the token bad guy Colonel Koobus Venter, relentlessly hunting Wikus down, does get his comeuppance. But the coda rather blatantly sets up the sequel by mentioning the aliens are resettled in District 10, Christopher's flying back in three years time with the mothership and possibly an army to free the slaves and Wikus might get his opportunity to return to human form. Wikus' wife is still alive, his father in law and corporate terrorist Piet Smit and the MNU (the subtly monnikered Multi National United) still control the government so it's a sure bet they'll all be back for the sequel. 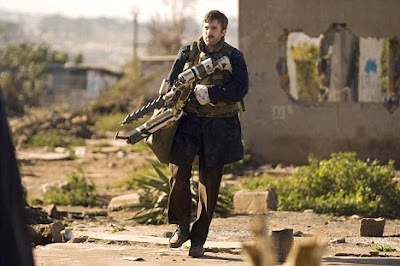 It's a great B movie and Blomkamp invests a lot of his ingenue energy into it and awkward as it might be at times it is at least attempting to address pertinent issues in a post-apartheid South Africa. Visually it looks impressive considering the relatively modest budget, capturing the look of the shanty towns and layering on the CGI vistas of spaceships and the put upon aliens. It'll be interesting to see how Blomkamp finds a balance between polemic and fantasy in the sequel.